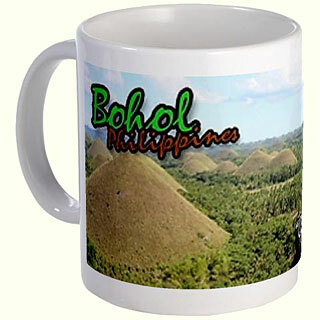 The Chocolate Hills are probably Bohol's most famous tourist attraction. They look like giant mole hills, or as some say, women's breasts, and remind us of the hills in a small child's drawing. Most people who first see pictures of this landscape can hardly believe that these hills are not a man-made artifact. However, this idea is quickly abandoned, as the effort would surely surpass the construction of the pyramids in Egypt. The chocolate hills consist of are no less than 1268 hills (some claim this to be the exact number). They are very uniform in shape and mostly between 30 and 50 meters high. They are covered with grass, which, at the end of the dry season, turns chocolate brown. From this color, the hills derive their name. At other times, the hills are green, and the association may be a bit difficult to make. Legend has it that the hills came into existence when two giants threw stones and sand at each other in a fight that lasted for days. When they were finally exhausted, they made friends and left the island, but left behind the mess they made. For the more romantically inclined is the tale of Arogo, a young and very strong giant who fell in love with an ordinary mortal girl called Aloya. After she died, the giant Arogo cried bitterly. His tears then turned into hills, as a lasting proof of his grief. However, up to this day, even geologists have not reached consensus on how they where formed. The most commonly accept theory is that they are the weathered formations of a kind of marine limestone on top of a impermeable layer of clay. If you climb the 214 steps to the top of the observation hill near the complex, you can read this explanation on a bronze plaque. Plenty of tourist guides and tour operators will be happy to bring you to the chocolate hills, either as a separate trip or as part of a day tour. However, if you want to go here on your own, from Tagbilaran, you will have to go the integrated bus terminal in Dao and catch a bus going to Carmen. If you look like a stranger, you will have a hard time not finding one. At the entrance of the bus terminal people will point you to the right bus. Make sure it is the first one to leave, and ask the driver to drop you off at the Chocolate Hills complex, about 4 kilometers before the town of Carmen. From there it is a 10 minute walk along a road winding up to the complex. To get back to Tagbilaran, you will have to walk back to the main road, and wait for a bus to pass by. The last bus from Carmen to Tagbilaran leaves at four P.M. Alternatively, you can use the services of the motorcyclists who often wait here for tourist, and ride 'habal-habal,' or motorbike taxi. If you're coming from Tubigon (arriving from Cebu by boat), a few buses go to Carmen daily, but sometimes you'll have to wait for some time for the bus to fill up. When you arrive in Carmen, you can catch the next bus or jeepney in the direction of Bilar, Loay or Tagbilaran, or ask a 'habal-habal' driver to bring you to the Chocolate Hills Complex. If you would like to stay in the Chocolate Hills, you have very little choice. The only facility is the Government run Chocolate Hills resort. Currently, this hotel is undergoing renovation and extension, but, since funds have run out, work on this is suspended, and you'll have to deal with the mess of a half-completed resort. However, the staff are friendly, and if you stay here overnight, seeing the sun rise over this bizarre landscape is worth the inconvenience. The place also has a still functional and maintained swimming pool, which is behind the unfinished building, a little bit downhill. Read all 453 comments by readers. your comments on "The Chocolate Hills"
This article has been viewed 4881 times.